Winter is coming? Winter is here. And for truck drivers, who cross the vast United States, that means the chance of severe snowstorms and perilous driving conditions. Any time you drive on ice or snow, you’re accepting a level of risk. But when you’re hauling an 80,000 tractor, you carry a special responsibility of safety for yourself and those around you. 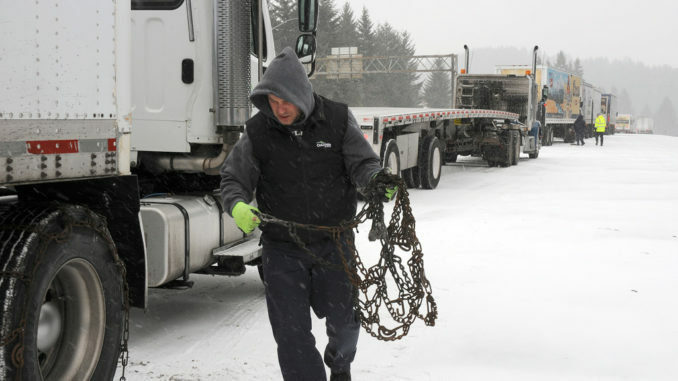 Here are 5 essential tips for truck drivers working in the cold winter months. Truck drivers know that miles are money. The more you drive, the more you get paid. But no amount of money is worth your life. Winter brings slick roads, and you don’t want to skid on the ice. In poor visibility, you may also be unable to see the taillights of the four-wheeler in front of you. Give yourself enough time to react to obstacle by slowing down. Of course, you’re already doing these. But just in case, it’s more important during the winter to be thorough with your pre- and post-trip inspections. Any mechanical or technical problems are magnified in rough weather. You want your truck to be in the best condition when driving on snow and ice. Prepare Your Truck and Cab. Driving isn’t the only danger for truck drivers in the winter. Because long-haul drivers sleep in the cab, it’s essential to make sure that the truck has proper heating. Ensure the heating unit is working, and that any auxiliary power unit (APU) is functioning correctly. If you fall asleep in the freezing cold without heat, you could suffer severe health problems and even death. Pack warm. Bring blankets, jackets, gloves, and boots. Sleeper berths don’t have much storage space, but these are critically important items during the winter. Don’t count on Neil Gorsuch to save you. Practice installing and removing your tire chains, so you’re ready. Tire chains will increase your traction when driving in winter conditions. They’re especially necessary for mountains and steep inclines. But make sure you only use the tire chains when there’s ice or snow. If you don’t remove them on dry roads, you might skid or slide when braking. Call in Late If You Have To. If you’re late on a delivery or if weather conditions are too poor to drive, don’t risk it. Call your dispatcher. Call the shipper/receiver. Your company has dealt with poor weather before. They will understand. The most important tip for winter trucking is to protect your safety above all else. Loads can be delayed.